Ready in 5 mins. Prepared with sunflower oil. Gluten free. Suitable for vegetarians. Kosher - SKA. 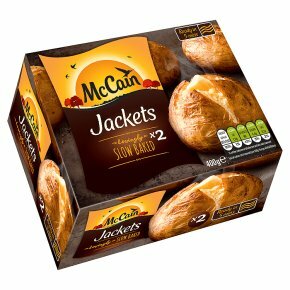 Here's how to cook 1 or 2 McCain Jackets. If cooking a different amount, adjust the cooking time accordingly. To get the best results cook from frozen, our instructions are guidelines only. For the most delicious results, do not overcook!Please take care: After cooking the potato will be very hot!Do not leave microwave oven unattended while cooking. Do not use this product after the best before date. Preheat the oven to 220°C/210°C Fan/Gas Mark 7. Place your Jackets onto a baking tray and pop them into the middle of the oven. Bake for 45-55 minutes, until they're lovely and crisp. Remove from carton and place your Jackets in the microwave oven. Cook on full power. Ensure potato is piping hot throughout before eating.x1 Potato: Cat B / 650W 5 mins 10 secs, Cat D / 750W 5 mins, Cat E / 850W 4 mins 30 secs.x2 Potatoes: Cat B / 650W 8 mins 10 secs, Cat D / 750W 7 mins 40 secs, Cat E / 850W 7 mins.Leave to stand for 2 minutes.Please note: all microwave ovens vary - you may need to adjust cooking times to suit your own model.